Brings out the excitement and emotion of recorded music and live broadcasts through restoration of hall acoustics and ambience. New, patented technology based on extensive research into concert hall/recording venue acoustics. Transforms sound of a stereo or audio visual system. -Easy to install and simple to operate. Two small rear speakers the only extras needed; processor has internal amplifier for rear speakers. Domestically friendly, wide choice of rear speaker placement and listening positions. SuperStereo improves musical quality and enjoyment of mono, old and poorly recorded material. Most cost effective up-grade to any stereo system. 1. SuperStereo is the term used to describe a new system of music reproduction using a highly original sound processor, the Adp-2, developed by the Dynavector company. The system uses four loudspeakers (two more than normal stereo) to give concert hall realism to the playback of music, whether recorded or broadcast live. 2. 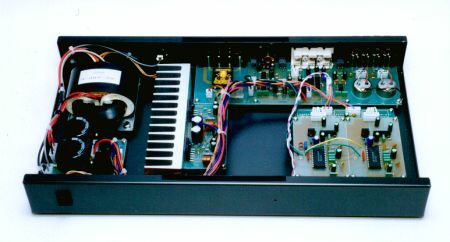 The Adp-2 consists of a sound processor with a built-in amplifier for a pair of rear speakers. It has been designed especially for music lovers to give a lifelike playback of all music sources, CD and laser players, tuners, tape and record players. 3. Perfection of the technology and development of the processor is the culmination of more than ten years research by Dr Tominari of the Dynavector company in Tokyo. He describes the sound produced with the processor as "SuperStereo" to emphasis its superiority over normal stereo sound. The processor has been acclaimed by audio critics and music lovers in Japan and is now being launched by Dynavector in the European market. 4. Besides being highly effective, the processor is easy to use. Simply connect the Adp-2 to your integrated amplifier, or between the pre-amplifier and main amplifier if separate units are used, and add two rear speakers. Step by step installation instructions are provided with each unit. 5. The processor can equally be used with TV's with extension speaker terminals and other audio-visual equipment to enhance the authenticity of the reproduced sound of films, concerts and programmes such as sports events. What are the Advantages of the Adp-2 Over Other Processors? 6. The system used in the Adp-2 is unique. Novel, frequency related time delay and sound dispersion circuitry is used and the design technology is protected by patents granted in the UK, other EU states and the USA. It is significantly different from other processors which seek to produce a surround sound ; the Adp-2 aims to recreate the true sound of the concert hall which is missing in conventional 2 speaker stereo and surround sound type processors. Careful attention has been paid to the design of the processor and its amplifier to ensure the most musical results. 7. With the SuperStereo processor, the positioning of the rear speakers and size of room are not critical, neither is it necessary to have expensive speakers or cables; the Adp-2 will produce remarkable results without them, even out of doors. 8. Dynavector's SuperStereo processor has been the subject of favourable reviews in the Japanese audio press, notably by the Journal of the Japan Audio Society and Stereo Sound magazine. 9. Dynavector Systems Ltd was established in the 1970's by Dr Noboru Tominari, a Professor of Engineering at Tokyo State University, and quickly established its reputation for the design and production of moving coil cartridges which are still produced today, along with SuperStereo processors. Dynavector SuperStereo has been formed to distribute the processors in Europe by mail order while Dynavector's audio cartridges continue to be sold through the normal retail channels. How Easy is the SuperStereo Processor to Install and Use? 10. Installation is quite straightforward by following the instructions provided with each processor. Once connected up, the processor is as simple to use as any audio amplifier, the main control being for the adjustment of the volume to the rear speakers. What Kind of Speakers Work Best with the SuperStereo Processor? 11. Extensive listening tests have shown that the processor works very well with small speakers and that it is not necessary to have a large system to obtain very good results. The rear speakers, in particular, can be positioned high up so that no floor space and minimal room space is needed. The processor works best without subwoofers or bass reinforcement speakers. 1. Since the invention of the gramophone by Thomas Edison, the progress in acoustical technology has been remarkable. Yet, to most frequent concert goers, those who truly appreciate the sound of the live performance, the music reproduced by conventional two speaker systems fails to provide complete satisfaction. They say such systems, despite their often good basic fidelity, fail to provide the seductive charm and real ambience of the concert hall. 2. In contrast, Dynavector's SuperStereo not only reproduces the music signals but also the lifelike ambience of the concert or event which takes place. It thus provides 3-D reality in the home. 3. Dr Noboru Tominari, the inventor of SuperStereo, has been conducting his own research and development for SuperStereo since the 1980's based on a close study of sound behaviour in concert halls. Leaving aside traditional acoustic and vibration theory, he has returned to the basics of physics and closely investigated wave propagation which has been largely ignored by audio engineers. The result is a processor which operates by wave form dispersion in which frequency dependent sonic waves are produced. The system can reproduce the sonic wave behaviour similar to concert halls and other auditoria. 4. It is evident that a double bass, for example, when played in a concert hall, sounds quite different from one played in a field. In a well designed hall, the bass part of the music is beautifully projected with a sufficient sound pressure level. In a open field, however, the bass part of the music is hardly heard at all. The clarification of the reasons for this striking difference has remained elusive until now. This, Dr Tominari believes, is the most significant consideration in both sound recording and reproduction. 5. It was this problem which Dr Tominari addressed in the development of the SuperStereo system, leaving aside the over-dependence of conventional thinking based on Fourier Laplace for treating problems in sound engineering. This new approach arose from the belief that data on frequency response, distortion, sound pressure distribution and directionality of loudspeakers are not the best indices for understanding the phenomena taking place in a listening space or in a recording venue where music is played. 6. Dynavector's conclusion is therefore that a proper appreciation of wave theory is essential for those working in the audio field, otherwise, however much the effort, the results will disappoint. With SuperStereo, for example, mono recordings and poorly recorded material benefit greatly by having the sound of the original venue revived so that lifelike depth and the richness of the recording can be enjoyed. 7. When the sound of normal stereo is compared with SuperStereo using the Adp-2 processor, it is clear that the latter is able to bring out the reality of the recording venue, regardless of whether one is listening to the heavy notes of a pipe organ in a vast cathedral, the voice of a soprano or coloratura in an opera house or theatre, the rich sounds of a cellist or the lively rhythms of a dance band or pop group. 8. A feature of the SuperStereo system is that speaker placement is not critical. And small front and rear speakers produce excellent results. The technology ensures that it can cope with the low frequencies of real music and hall ambience, resulting in good bass response. 9. The failure to appreciate the importance of wave propagation theory by audio engineers, Dr Tominari considers, lies at the root of much of the dissatisfaction felt by music lovers and audio fans. As a consequence of this failure, consumers often spend large sums of money in constantly up-grading their equipment only to find that the audio nirvana sought has still eluded them. 10. The reason is that it is theoretically impossible for a 2-channel, conventional stereo system to get close to the original live sound. SuperStereo represents a breakthrough. It fills the gap and brings significant gains, whether used with modest or high end audio systems. To improve your system and enjoyment of music, the Dynavector SuperStereo processor is the most cost effective means available. 11. To fully enjoy recorded music played by an audio system, wave theory tells us that the restoration of the wave behaviour in the listening room similar to that in the actual concert hall is essential, a condition which is completely ignored by modern audio technology. Dynavector has proved this theory by showing that at least 4 loudspeakers are needed to recreate lifelike sound in a listening room. 2-speakers stereo cannot satisfy this theoretical requirement. If the conditions of wave theory are satisfied, however, the playback of recorded music becomes much more widely enjoyable at a modest cost, in any kind of listening situation and without the need for listeners to be in a particular position. 12. The beauty of SuperStereo with the Adp-2 processor is that the unit can be kept in the system as one of the necessary components if an even higher level of SuperStereo reproduction is desired through the use of 6-speakers. For more infomation, please contact the following distributor. Copyright (C)2018 Dynavector Systems, Ltd. All Rights Reserved.